Combine a variety of techniques to create monotype prints in this fun, informative workshop. Make your own stencils, printing blocks and relief plates with the natural surroundings as inspiration. 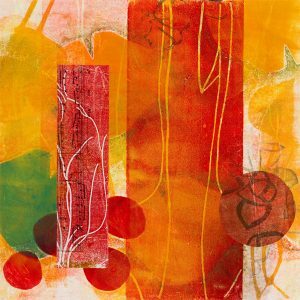 Learn to use these materials to create hand-printed collage papers. Next, develop a monotype series using your handmade printing tools, a ghost print technique, vibrant layers of oil-based inks, mark-making with water soluble crayons, and the chine collé method of collage. Oil-based printing inks are provided for this workshop. Vegetable oil is provided for clean-up. No solvents are used. Sitka Center for Art and Ecology is located just north of Lincoln City on the beautiful Oregon Coast. Call the Sitka office or visit their website for more information and to register.